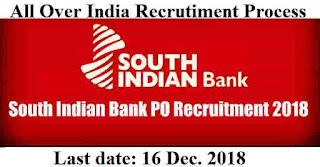 Today on 7th Dec. 2018 South Indian Bank invites young exciting applicants who fulfil the suitability standards specified and who are interested in making Banking career with one of India’s premier commercial Banks to apply for admissions to the one year Post Graduate Diploma in Banking and Finance programme in Manipal Global Education Services Pvt. Ltd. (MaGE), Bangalore. On successful achievement of the programme within the specified time period, the applicants would be offered employment in the bank as PO (Probationary Officer) in Scale-I. Applicants shall be selected through the selection procedure containing of online test followed by Group Discussion or/and Personal Interview. Admission to the One-year full-time post graduate diploma programme in Banking and Finance from Manipal Academy of Higher Education(MAHE) (Deemed to be University) to be conducted at Manipal Global Education Services Pvt. Ltd, Bangalore (MaGE) comes with the assured Banking career with South Indian Bank on successful completion of the course. Qualified Applicants are invited to apply ONLINE through the official Bank’s website www.southindianbank.com. No other means/modes of applications will be accepted. Before the registration, candidates are requested to ensure that there is a valid email id in his/her name. All future communications in this regard will be notified in our website including call letter for the Online Test, Group Discussion and Personal Interview. Vacancies: No Specified in PDF file. 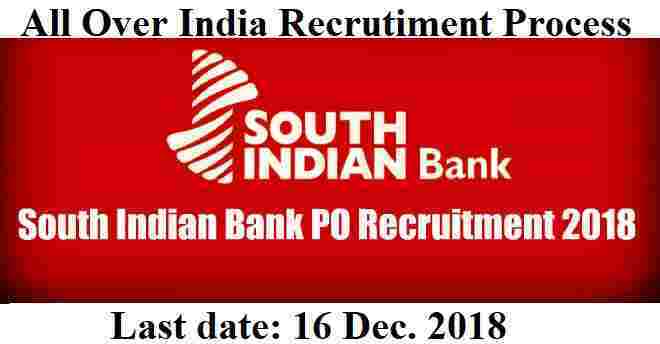 Education: Those who have passed in their Graduation degree with at least 60% marks can apply for this South Indian Bank recruitment process 2019. Age Bond: Must have applicants age less than 25 years for applying these Bank jobs in India 2019. Paying Method: You can pay the examination fee through the following method: “Debit Card, Credit Card, Net Banking or Pay Offline Through E Challan”. 10TH Dec. 2018 is the opening Date to apply. 16th Dec. 2018 is the Last date to apply.